Homage to absolute Gnosis, [the unity of] uncreate Clear Light and Emptiness. This Gnosis of self-existent Awareness (svayambhu-vidya-jnana), which encompasses all and abides in all, is open and impartial. Therefore, nail the original immutable Ground (prakriti) by using the seven nails of the Path of the Nonduality of Samsara andNirvana. 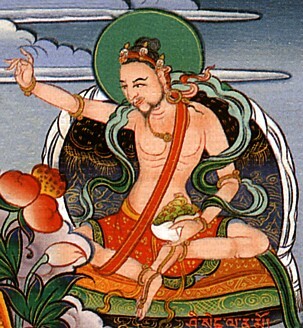 Thus shall primordial Great Bliss (mahasukha) arise in the mind. Affix the juncture of Samsara and Nirvana with the nail of unimpeded effulgent Gnosis. Affix the juncture of Observer and Observed with the nail of the self-radiant Clear Light. Affix the juncture of Self and Other with the nail of innate pure Ipseity (vastu). Affix the juncture of Nihilism and Eternalism with the nail of liberation from all Views (dristi). Affix the juncture of Phenomena (dharma) and Ultimate Reality (dharmata) with the nail of absolute Awareness (vidya). Affix the juncture of meditative Passivity (laya) and Excitation (auddhatya) with the nail of abandonment-of-sense-stimuli. Affix the juncture of Appearance (abhasa) and Emptiness (sunyata) with the nail of primordial Dharma-embodiment [of the Absolute].